DELUXE DOUBLE 180 GRAM LIMITED EDITION GATEFOLD YELLOW VINYL REISSUE OF ANTHRAXS FOURTH ALBUM. 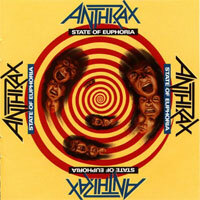 State of Euphoria is the fourth studio album by American heavy metal band Anthrax. It was released in September of 1988 by Megaforce Worldwide/Island Entertainment.